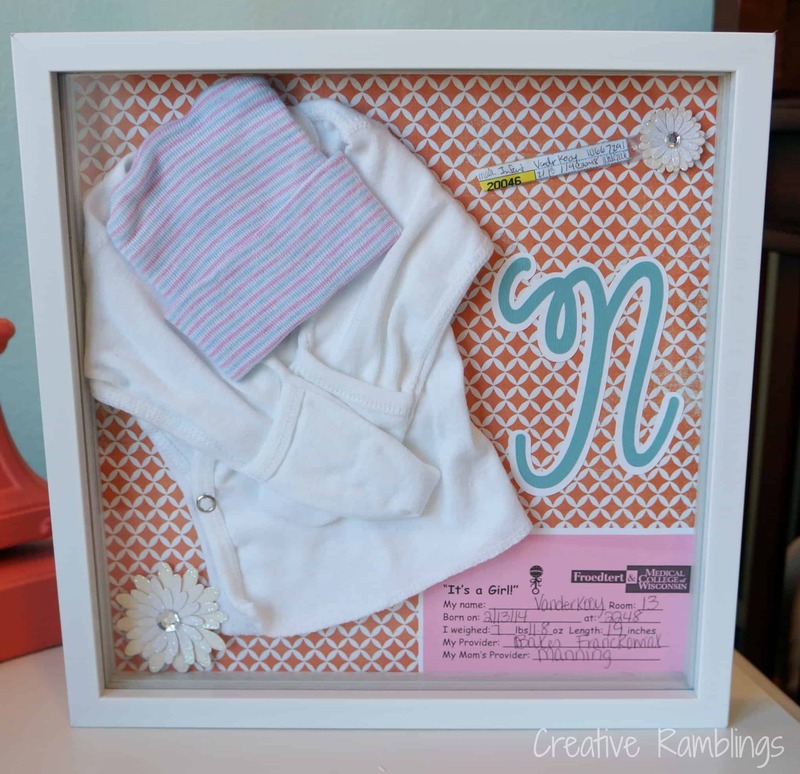 There are so many special items and memories from a baby’s first year. So many milestones I want to remember. The problem that usually arises is the lack of time and energy a Mom has in baby’s first year. A couple of months after Little Lady was born I pulled out a few pieces I had saved from her first days in the hospital – a t-shirt, hat, wrist band, and information card. 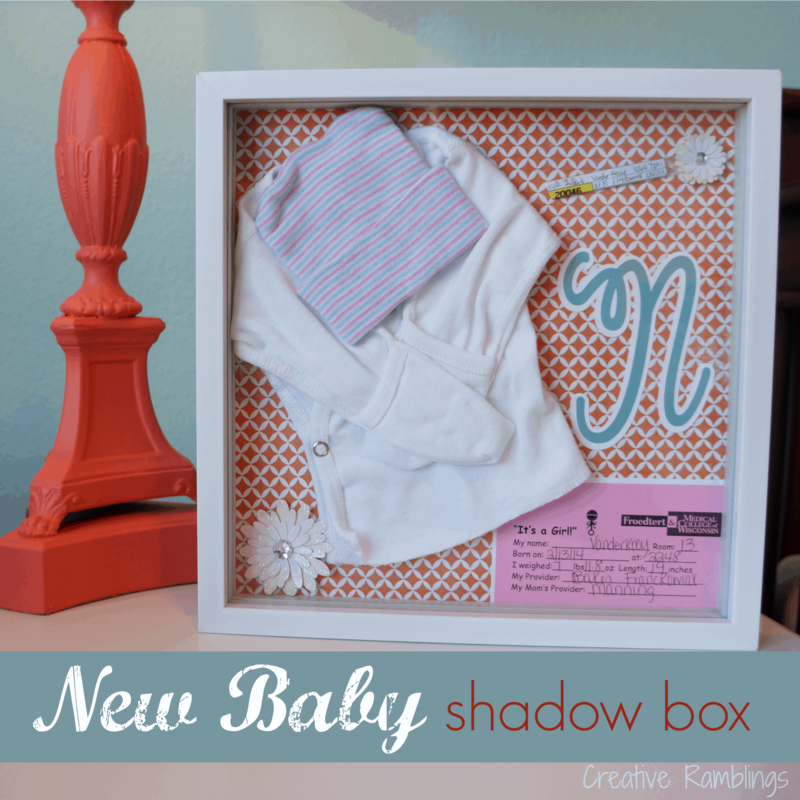 I toyed with a couple of ideas and ended up displaying these items, along with her birth announcement, in a baby shadow box. I am so happy I took the time to do this, it’s still in her room and every time I look at it I am reminded just how little she was and how much she has grown. 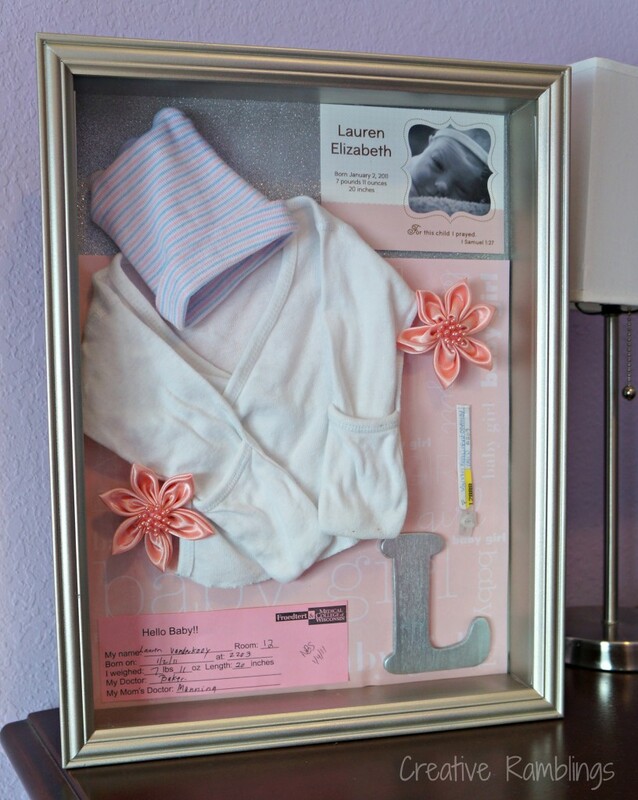 When Baby Girl was born, I knew right away I wanted to do the same thing with her hospital mementos. Baby Girl’s shadow box sits in her room on her night stand and I know I will soon be looking at this thinking “how did you get so big?”. I used the same items, minus the birth announcement. I dressed it up with paper and embellishments that coordinate with her room. The white frame blends nicely with her gallery wall too. How do you preserve your baby memories? A book, a journal, pictures? I’d love to hear your ideas. 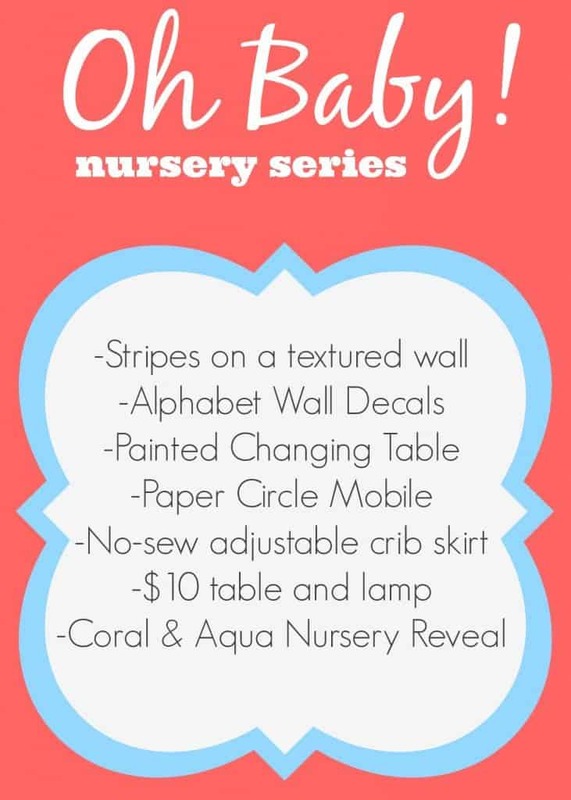 Want to see more from Baby Girl’s Nursery? Click on the picture below to see everything that went into this room. Congrats Blair! It’s such an easy project you can put your own spin on, thank you so much. So glad you like it, thanks Betsy. I do love looking at them, such sweet reminders. However I never got around to a baby book, kind of wish I had started one of those with my first. Thanks Theresa. Aww, these are so cute. 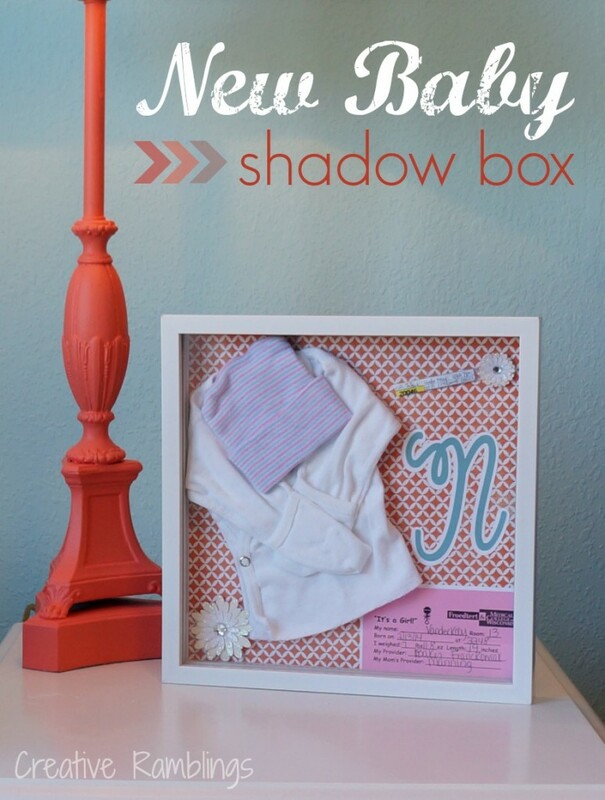 I really like shadow boxes. What a great idea. Where did you get the shadow box in silver? I have been looking for a cute shadow but cant seem to find the right one. I got that one at Michael’s a couple of years ago. They still have a great selection, and so does Hobby Lobby. Good luck finding one you love.